But the ties into the LGBTQ community don’t stop with the video. U2 is continuing to promote the single in that community. New artwork promoting the single feature the title, “Love is Bigger Than Anything in its Way” on the front against a rainbow background. The rainbow flag is a symbol of gay pride and reflect the diversity present within the LGBTQ community. The flag is used worldwide in Pride celebrations and was first introduced in 1978. The rainbow featuring predominantly in the artwork of the new single is no mistake. The band is also working with a number of producers to remix the single. This includes a number of DJs who are also members of the LGBTQ community, as well as a number of DJs who will be playing major events for Pride in various cities in the upcoming month of June throughout North America and indeed the world. These are the tastemakers which will be choosing the music for these worldwide events this summer. DJ Offer Nissim is using his remix of U2’s “Love is Bigger Than Anything in its Way” for advertisement of a pride celebration at Ganei hata’arucha in Tel Aviv, being held on June 9, 2018, where he is expected to spin his new mix of “Love is Bigger Than Anything in its Way”. The full version of the song is expected to be delivered for promotion soon. The remixes released so far have reached #49 on the Dance Club Songs chart on Billboard, the first U2 to reach those charts since “Magnificent” hit there in 2009. The promotion doesn’t stop there. We are told that U2 will have a presence at Pride events worldwide this summer through the distribution of promotional material. The Long Beach pride event on Sunday in California featured people handing out fans to those gathered for the Long Beach Pride Dance Tent, with the slogan “Love Is” on one side against a rainbow background, and “Bigger Than Anything in its Way” on the backside in black and white, along with information about the single. We are told that these fans, as well as posters for the single will be given out at Pride events throughout June. The event at Long Beach is the first where these have been given out that we are aware of, but look for events where the DJs who have remixed the song are appearing, its likely these fans will be given out there as well as at parades and other events through the summer. The song was also recently performed on television on the Ellen Degeneres show. Degeneres, a well known activist for LGBTQ human rights, recently featured on The Joshua Tree tour as part of their presentation of women pioneers during “Ultra Violet” titled HerStory, including prominent lesbian and transgendered human rights crusaders among those who had lead the charge for women’s rights. It isn’t the first time U2 have been supportive of the LGBTQ community. In 1995 they donated a track to the compilation album, “Out Loud: For the Human Rights of Freedoms of Lesbians and Gays“. 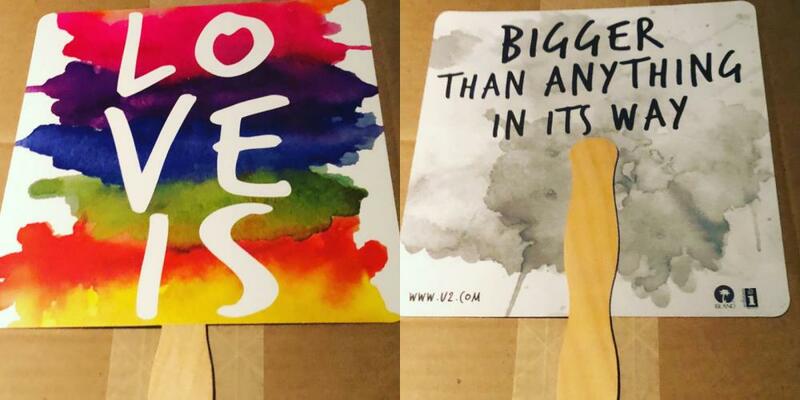 More recently, in 2015 when Ireland was voting on gay marriage, U2 posted an image which said “in the name of love…#VoteYes” urging those at home in Ireland to support the gay marriage vote. These are just two examples of decades of support they have shown for the community throughout their career, they’ve also spotlighted the work of prominent gay artists such as David Wojnarowicz (cover of “One“), Keith Haring (throughout PopMart) and Peter “Troy” Davies (appearing on one of his Ecco Homo single) and others over the years.